Araxi has been a Whistler staple for as long as I can remember. The restaurant is very popular and especially during the Christmas/New Years times you will need reservations to secure a table. We revisited this restaurant last year and my family, especially our son, found a new love for this locale. James Walt, the Executive Chef, is one of the most highly decorated chefs in Canada and has a very impressive resume including a stint at the Executive Chef to the Canadian Embassy in Rome. He lives locally to Whistler which helps enable his farm to table efforts as he can work directly with farmers in the area to bring the freshest ingredients to the ever changing menu. There are staples of course, but things that appear are seasonal and sides change. He has authored 4 cookbooks that look amazing and talk about seasonal eating and following the farm to table movement. I really want to have a look through them because I feel like I might be inspired by what he has written about. 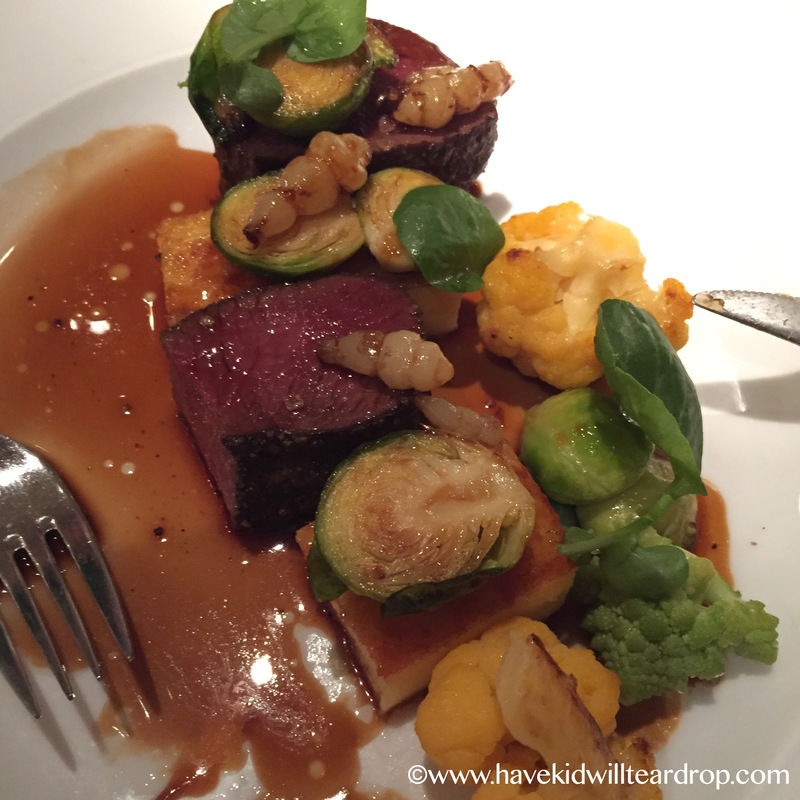 This time I tried the loin of venison with Parmesan polenta and various seasonal vegetables (which included romenesco cauliflower, Brüssel sprouts, wilted spinach, and cauliflower). This was something I can’t get at home (at least not very easily) and I wanted to make sure I tried something new. It was absolutely delicious. 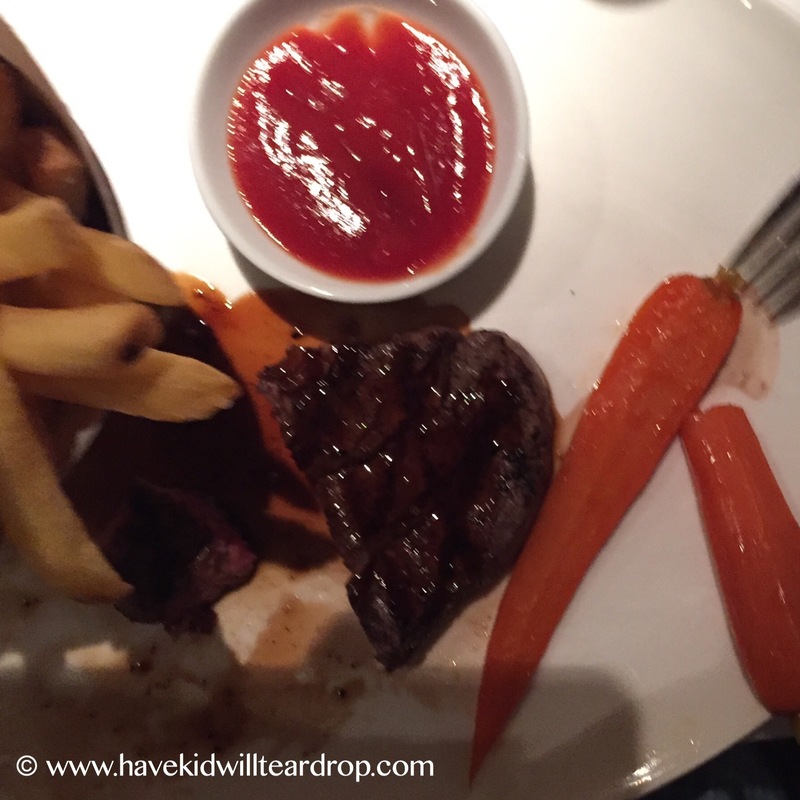 My husband had a salmon dish he really loved, and the kids menu boasts a steak that my child will not stop talking about. Last year he proclaimed it was better than anything I have ever made for him (which smarted a little considering I think of myself as a pretty good cook – another reason I should probably get one of the cook books, right?) and this year he said it was even better than last year! He has been craving that steak since we left last December! My husband started with the ceviche and he thought it was ok, but nothing overly special. I had the beat salad, and while it tasted good I felt the price of $17.99 was a bit steep for what was plated. I was left wondering if they had split the salad and forgotten to bring the other half out since we had talked of sharing. These were our only disappointments. We didn’t try their seafood platters despite their amazing appearance, but we have had their oysters in the past and they have always been really delicious. We recommend those if you like oysters! The pricing here tends to be on the higher side, and they work really hard to give you delicious food and a wonderful experince. The service is very good and they are very careful about food allergies and working with you if you let them know what you can’t have. All of this has us coming back.